I loved Steven Amsterdam’s incredibly popular novel, Things We Didn’t See Coming. I think what I enjoyed most about it was Amsterdam’s knack for putting characters in situations that a reader must find foreign, and thus exciting and engaging, while still keeping his finger on the pulse of reality. Even though we can only guess at what it would be like living in a post-Apocalyptic world, we know what it is to be human, and Amsterdam writes that so well that we accept the Apocalypse as the premise. His latest offering, What the Family Needed, likewise takes some really average human beings and puts them in extraordinary situations, forcing the reader to seriously ponder, What would that be like? The story follows one particular family over many years, starting when the children are under ten years old, through to when they’re about fifty. 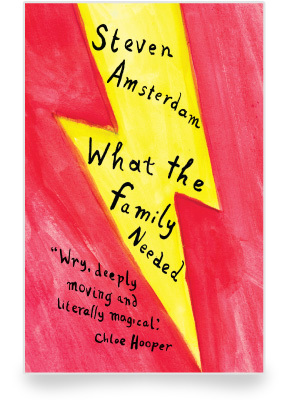 This family goes through the regular traumas that all families do: births, deaths, marriages, and all the rest. The thing about this family is that they all develop super-powers. One can fly, one has amazing strength, one can match-make like Cupid. Despite all their amazing abilities, these super-powered people still have problems. While this kind of premise would usually turn me off a book, I had no idea that was even what I was getting myself into when I picked this one up. I was going by my love of Things We Didn’t See Coming. And I’m glad I went with it, because Steven Amsterdam breathes life into this well-worn idea. What would you do if you had super-powers? What Amsterdam does is exactly what he did in his previous novel – he keeps firmly in touch with reality, despite a wacky premise, and the true humanity in this book is what made it such an enjoyable read. At times the moment when characters realise they have powers seems a little thin – but I’m not entirely sure what I would want for these moments to seem more credible. I’ve never developed the ability to fly, so I have no idea what that would be like. The more important bits are where characters exercise their powers and try to improve their lives with them. What matters is the exploration of how human we’d still be, even if we could do anything we wanted.